Intrview by Mike Morton (Heavy Metal Examiner) (eng) | Официальный сайт московской фолк-метал группы "Калевала"
It may seem an obvious notion, but MySpace truly does offer a world of music at one’s fingertips. Anyone can log on and search for new music by style, looking through Top Friends of other bands, or simply wait for those pesky Friend Requests to pile up in one’s in-box. Many bands abuse this capability and use MySpace simply as press release fodder (like having x-amount of MySpace friends means anything to the industry). However, there are those honest bands who use the tools simply to promote their music and put it out there for anyone to enjoy. It was here that I stumbled upon a genre of music that I previously was unaware of, that of Russian folk metal. 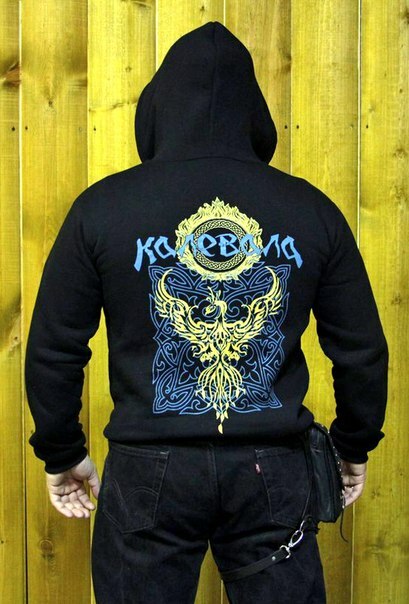 About a month ago, I received a Friend Request from the Moscow-based band Kalevala, most likely due my “Friendship” with bands like Korpiklaani and Moonsorrow. But rather than delete this message, I became curious, largely due to the name; why would a Russian band name itself after a collection of Finnish folklore? So I went to the page and checked them out. A week later, I had the CD, courtesy of Napalm Records European mail order (it is not available stateside, unfortunately). I was enthralled with the music so much, I decided to research music in the area and was surprised to find an entire scene of great folk music in the Russian vicinity; bands like Tenochtitlan, Arkona, Pagan Reign and several others, some of whom have been releasing music for ten years. Until this point, my only exposure to Russian hard rock / metal was limited to Autograph and Gorky Park. Unfortunately, this phenomenon was not covered in Sam Dunn’s documentary Global Metal, and shame on him for overlooking it. Regardless, my eyes have been opened to a new wellspring of fantastic music, and all started because of a band called Kalevala. Read on as the Examiner discusses Russian folk metal with Kalevala’s guitarist Nikita Andriyanov and vocalist Kseniya. How long has Kalevala been around? Do you currently only have one album in release? Nikita: Our group was established in May or June in 2007. We released our demo of two songs (“Goy, Olen’!”(Goy, Deer!) & “Pastushok” (The Cowboy) on the internet in September, and in April 2008 our debut album came out. It was released by the Moscow-based label Sound Age Production. The title translates into English as "The Tow of the White-Snow Flax". How long did it take the band to put the album together? [Note: the Examiner program does not acknowledge Russian text, which is why the title is not mentioned.] You all seem like very skilled musicians; how did you come to develop your sound? Nikita: We recorded it in about 2 months. We did a lot of analog recording, which was our initial recording experience. The band’s sound developed gradually from our first jams, which was a mix of hard-rock riffs and solos with folk accordion and certainly Kseniya’s perfect vocals. The idea of forming a group arose 5 or 6 years ago, when accordionist Olen’ (Deer) and I were participating in the Russian folk orchestra at music school. We both like classic hard rock bands like Deep Purple, Black Sabbath, Rainbow, etc. Olen’ even played Ozzy’s "Crazy Train" on accordion - including Randy Rhoads’s solo. So, when Kseniya and I decided to put our own folk-group together (after we left Nevid – Moscow pagan metal band), I willingly asked Deer to play with us. In the future, we don’t want to remain confined within the limits of one style, like our 1st album, but we don’t want stray from the basic sound. Are any of the band members Finnish? I am wondering how The Kalevala inspires the band, as I was under the impression that it was a Finnish book, and not Russian. Kseniya: I’m Finnish by birth, meaning my parents are from there, but I’ve never actually visited the country. I’m keen on Finnish legends and myths. I know a bit of Finnish, but I should really learn it a little more. Kalevala is a cool book. I like the musicality used in the runes of the legend. I understand that a couple of your songs are based on traditional Ukrainian folk songs and tales, as well as Kalevala itself. Kseniya: Yes, there is a cover-version of Ukrainian folk song in our album. It’s very popular in Russia. People sing this song at many festal meals. But in general, our songs are about the North. For example, “Goy, Olen’!" is based on the Mari legend that tells us that every day the reindeer brings us the Sun on his antlers, running around the Earth, and when night comes, it hides the Sun behind the skyline. It’s a symbol of new life and birth of the new day. Our new album Kukushkiny Deti will include the song “Kalevala”, which is a mix from the 2nd Kalevala rune. It turned out to be quite a nice song. How important is sharing these stories with the world? Kseniya: Share with the world? Why not? Russian, Finnish, and Ukrainian are very authentic cultures! I’m sure that songs of many Russian bands will easily take their place in playlists of Western listeners! And I’m also sure that folk music will rise in popularity! What is the relationship between the Finnish people and the Russian people? Do the two have a lot of cultural similarities that most Westerners do not realize? Kseniya: Unfortunately, I haven’t communicated closely with many Finnish people, but I can say that we both like vodka and argufy with them about who originated it: Russia or Finland? I think if a Russian is given a pail-full of vodka, he will get drunk just as fast as his Finnish friends do. We share a brotherhood, an equality and friendship between our nations. Whether "the majority of the western people" can understand these things - I can’t answer that question. As I am relatively unfamiliar with modern Russian culture and lifestyles, could you tell me, what are your musical influences? Nikita: Classic hard-rock and hard ’n’ heavy thrash including Deep Purple, Rainbow, AC/DC, Iron Maiden, Metallica, Slayer, Megadeth deeply influenced me. From folk bands, I’d like to mention Korpiklaani and the band of my idol from childhood Ritchie Blackmore’s band Blackmore's Night. The majority of our music is written by me. I record demos at my home studio and then give them to Ksenya to see if she likes it (usually she does).Then she writes lyrics, and at our rehearsals, every member of the band discusses the new material on equal terms. Is your album only available in stores in Russia, or does it have a wider distribution? Nikita: Our CD, of course, has distribution from our label and is sold throughout the country. Our label also trades with foreign ones that have an interest in folk music. I’d like to point out that everybody may order our CD through Napalm Records’ website in Austria. We’ve also received letters from fans who said that they had bought our CDs at a store in Tokyo. It’s a very joyful experience hearing that. It seems that there is a big heavy music scene in Russia and its related territories that the rest of the world is not yet aware of. How important are websites like MySpace in helping bands like you get worldwide recognition? Nikita: In my opinion, MySpace is a very important web page for worldwide promotion of the group. It helps us to announce our material to people all over the world, and communicate with different web magazines & music portals. We are always ready to answer questions our fans send us through MySpace. So we pay a lot of attention to this resource. We are also going to make English version of our official web page in the near future. What is the importance of keeping your song titles and lyrics in your native language? Do you fear that it might limit your audience, or are you looking at successes like Korpiklaani as a sort of role model? Nikita: In my opinion, the most famous songs by Korpiklaani are in English, especially their earlier albums. I can’t say that we idolize them, as we are not going to write lyrics in English. Kseniya: I don’t see any sense in playing music that isn’t understandable to my nation. I’m not in pursuit of massive international acclaim. It’s important for me to give Russia my affection and warm-heartedness, in our native language and receive their warm-heartedness in return. 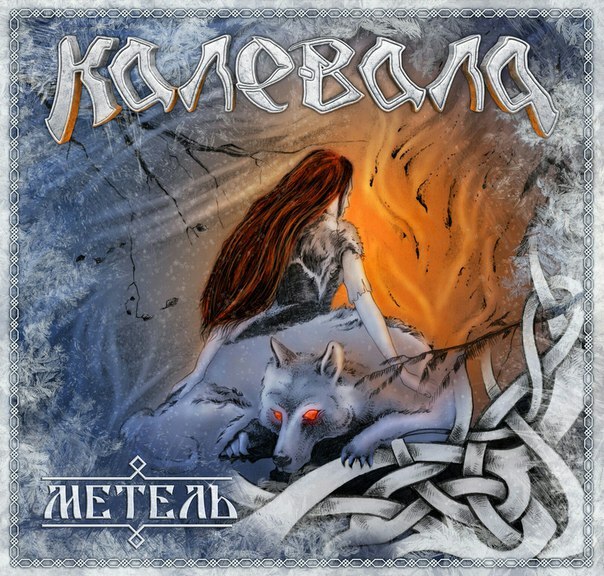 Kalevala is very different from the other folk metal bands out there in that you really put an emphasis on the traditional music and composition, rather than “metalizing” everything. Was that always a goal of the band? Nikita: We’ve never limited ourselves to any stylistic restrictions. We play music we like, and we don’t have any conception of “metalizing” or “softening” anything specifically. We do things we like at the moment. You are also very different in that you utilize female lead vocals, which is rare in the folk metal community. Most bands use females as accompanying vocalists, not the lead. I think this really adds another dimension to the band’s sound. Was this a conscious effort of Kalevala, or did you not have anyone else in the band who could sing as well as Kseniya? Nikita: I originally planned Kalevala to be the project of Kseniya and I, as I had my music and Kseniya had her lyrics. When we both played in Nevid, we wrote pagan/folk songs together. At that time, it went without saying that Kseniya would be the vocalist. On our first album you can hear vocals of Valeriy Naumov, the vocalist of Russian band Ivan Tsarevitch, whom we invited to perform the cover of the Ukrainian song with Kseniya. Shmel (Bee), the bass-guitarist, performs backing vocals when we play live. He also sings in the pagan-folk band Rarog and on the later albums byArkona, he sang in the low male choirs. Are you aware that there is an Italian folk metal band bearing your name? They sound like they play more sea shanties, like Alestorm, than actual folk metal. Is there any rivalry between the bands? Nikita: I did come across that band on MySpace and chatted with them for a bit. They played passionate and have an accordionist, too! When we decided to call ourselves Kalevala, I scoured the Internet and found no band with the name (we named the band in 2007)! The only thing I found was an old Finnish art-rock band which had since changed its name. I don’t know exactly how long these guys have been playing for. They didn’t have a MySpace page two years ago, and there is almost no other information about them on the Internet. What happened to your drummer, and have you yet found a new one? Nikita: We had a difference of opinion with our drummer, so we parted with him. At present, we are looking for somebody to take his place. But we don’t want to put aside the recording of our 2nd album, so we are going to invite session musicians to assist. Will you be playing any of the European festivals this summer? Nikita: Unfortunately, we won’t. We had received some invitations but they weren’t approved. We are pinning our hopes for some shows with the 2nd album. Have any labels yet expressed interest in the band? I’m very surprised that you are still an independent band without any real label support. You have a very high quality sound and a great product to offer the world. Nikita: Yes, some labels are expressing interest in the band, but they are Russian labels. The problem is that in Russia, you make a contract only for the selling of the album. Our first album was released by Sound Age Production, but we were not completely satisfied with them. So we are looking for the right and proper one to release our 2nd album. When can we expect to hear the new album, do you think? Nikita: The songs from our 2nd album (The Cuckoo’s Children) are already written and we are ready to record them. We are hoping to release it in July or August. It is ten brand new folk-metal songs, and while it certainly resembles our 1st album in style, we threw on some definite changes, as we are always growing and developing. We played the material on a few concerts which you can find on the Internet. For more info: visit Kalevala at their official MySpace page.